The Games We Played – Test Drive (C64) | OhGizmo! Are Airlines Doing This So That We Won’t Complain About The Surcharges? I think it’s safe to say, without a shadow of a doubt, that the original Test Drive was the greatest ‘driving around a mountain’ simulator ever developed for any gaming console. At least that’s what I assumed the game was about, since there was always a towering brown wall to the right of your vehicle you had to avoid, in addition to the occasional traffic coming from the opposite direction. And even though I had no idea where they could set up a speed trap on a mountain road, the game also required you to watch your speed, otherwise you’d find the police chasing you in your rear-view mirror. Thankfully your car was also equipped with a radar detector (the device in the upper left corner of the screen) so you knew when to keep your speed down and when you could jam your joystick all the way forward. But I think what really attracted most kids and even automotive enthusiasts to the game was that Test Drive featured actual licensed cars, and as far as I know it was the first driving simulator to have that. You had your choice of 5 different performance vehicles including the Chevrolet Corvette, the Lamborghini Countach, the Porsche 911 Turbo, the Ferrari Testarossa and the Lotus Esprit Turbo. As you scrolled through the choices you also got a brief spec sheet for each ride so you could see how they performed in terms of acceleration or 0-60 times. (Not that any of those numbers actually translated that well when it came to the in-game driving.) As a kid I can remember being absolutely blown away at the ‘high-resolution’ graphics of each car on the selection screen, and while I shake my head looking at them today, back then it made me wonder how things could ever improve. 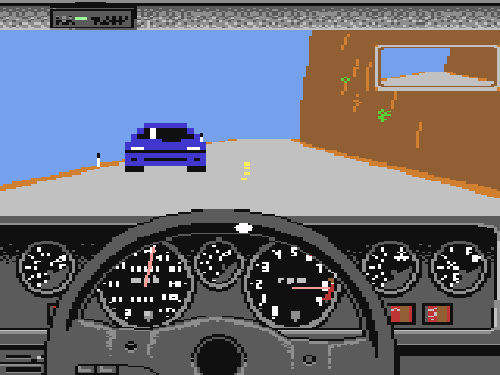 Thankfully though, the original Test Drive was far from the pinnacle of video game graphics. I loved this game. Seeing that screenshot of the car selection screen brings it all back. This was one of those games that wowed in the day. I loved this game! I thought it looked immense on the C64, and the speeding police cars really added a dimension to the game. But it did look a heck of a lot better on the Amiga/Atari ST.
Like most of the people here, I also loved this game a lot! thanks for the post.